Nearly all major airlines have reduced the allowed depth for carry on bags to 9 inches (eg. JetBlue, United, Delta). A huge percentage of carry on luggage I see at the airport is greater than 9 inches deep. In general, is it now a problem to get a 9.5 inch deep carry-on bag on JetBlue? Do the rules tend to be enforced differently on men and women, taller and shorter people? What motivated this question is that I travel approximately 30,000-50,000 miles a year for many years and have NEVER been questioned on the size of my carry-on luggage. I have NEVER been asked to put my luggage in a luggage gauge. The first time was by a JetBlue employee in Boston prior to security (and who appeared to only be stopping unaccompanied females). The other time was by a 30 something male JetBlue gate agent in Boston who took my girlfriend's bag but proceeded to let much larger bags onto the Airbus A320. 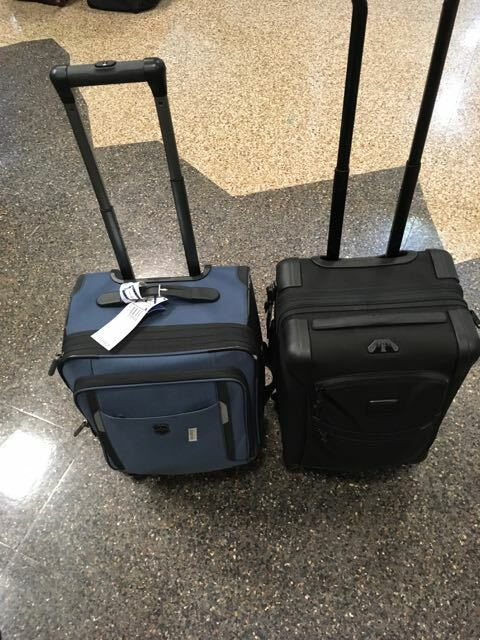 If you measure both bags, they're somewhere between 9 and 10 inches deep and easily fit in the overhead compartment of A320s, B757s. Clearly anecdote isn't carefully collected, unbiased data, but I'd love to know what other experienced travelers have observed. Is my experience an outlier / is hers? My impression is that airlines have made a huge share of carry-on luggage against the rules. How consistently does JetBlue enforce its rules? Given the diverse nature of airline staff, I highly doubt there was any 'profiling' going on. If your GF is a less than frequent traveler, it may have been the case that she's is boarding near the end of the queue, when overhead space is becoming scarce. Was she also encumbered with other items beyond what would fit under the seat such as a coat, large handbag, etc? Gate Agents tend to be much more hawkish in the winter. With Aegean airlines GoLight how many pieces of cabin baggage? Are seats allocated together? Do Carry-On-Size Duffel Bags Exist? Two bag limit on Hand/Carry On Baggage at Heathrow?